Plagiarism is considered academic dishonesty and a breach of journalistic ethics. It is subject to sanctions such as penalties, suspension, and even expulsion from school or work. Recently, cases of "extreme plagiarism" have been identified in academia. The modern concept of plagiarism as immoral and originality as an ideal emerged in Europe in the 18th century, particularly with the Romantic movement. Within academia, plagiarism by students, professors, or researchers is considered academic dishonesty or academic fraud, and offenders are subject to academic censure, up to and including expulsion. Some institutions use plagiarism detection software to uncover potential plagiarism and to deter students from plagiarizing. Some universities address the issue of academic integrity by providing students with thorough orientations, required writing courses, and clearly articulated honor codes. Indeed, there is a virtually uniform understanding among college students that plagiarism is wrong. Nevertheless, each year students are brought before their institutions’ disciplinary boards on charges that they have misused sources in their schoolwork." However, the practice of plagiarizing by use of sufficient word substitutions to elude detection software, known as rogeting, has rapidly evolved as students and unethical academics seek to stay ahead of detection software. An extreme form of plagiarism, known as contract cheating involves students paying someone else, such as an essay mill, to do their work for them. For cases of repeated plagiarism, or for cases in which a student commits severe plagiarism (e.g., purchasing an assignment), suspension or expulsion may occur. There has been historic concern about inconsistencies in penalties administered for university student plagiarism, and a plagiarism tariff was devised in 2008 for UK higher education institutions in an attempt to encourage some standardization of approaches. However, to impose sanctions, plagiarism needs to be detected. Strategies faculty members use to detect plagiarism include carefully reading students work and making note of inconsistencies in student writing, citation errors and providing plagiarism prevention education to students. It has been found that a significant share of (university) teachers do not use detection methods such as using text-matching software. A few more try to detect plagiarism by reading term-papers specifically for plagiarism, while the latter method might be not very effective in detecting plagiarism – especially when plagiarism from unfamiliar sources needs to be detected. There are checklists of tactics to prevent student plagiarism. There are calls for diploma mills to be made illegal in the United Kingdom, in New Zealand and some jurisdictions in the United States they are already illegal. The reuse of significant, identical, or nearly identical portions of one's own work without acknowledging that one is doing so or citing the original work is sometimes described as "self-plagiarism"; the term "recycling fraud" has also been used to describe this practice. Articles of this nature are often referred to as duplicate or multiple publication. In addition there can be a copyright issue if copyright of the prior work has been transferred to another entity. 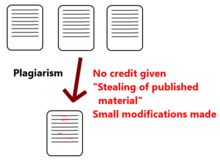 Self-plagiarism is considered a serious ethical issue in settings where someone asserts that a publication consists of new material, such as in publishing or factual documentation. It does not apply to public-interest texts, such as social, professional, and cultural opinions usually published in newspapers and magazines. Miguel Roig has written at length about the topic of self-plagiarism and his definition of self-plagiarism as using previously disseminated work is widely accepted among scholars of the topic. However, the "self-plagiarism" has been challenged as being self-contradictory, an oxymoron, and on other grounds. For example, Stephanie J. Bird argues that self-plagiarism is a misnomer, since by definition plagiarism concerns the use of others' material. Bird identifies the ethical issues of "self-plagiarism" as those of "dual or redundant publication". She also notes that in an educational context, "self-plagiarism" refers to the case of a student who resubmits "the same essay for credit in two different courses." As David B. Resnik clarifies, "Self-plagiarism involves dishonesty but not intellectual theft." According to Patrick M. Scanlon, "self-plagiarism" is a term with some specialized currency. Most prominently, it is used in discussions of research and publishing integrity in biomedicine, where heavy publish-or-perish demands have led to a rash of duplicate and "salami-slicing" publication, the reporting of a single study's results in "least publishable units" within multiple articles (Blancett, Flanagin, & Young, 1995; Jefferson, 1998; Kassirer & Angell, 1995; Lowe, 2003; McCarthy, 1993; Schein & Paladugu, 2001; Wheeler, 1989). Roig (2002) offers a useful classification system including four types of self-plagiarism: duplicate publication of an article in more than one journal; partitioning of one study into multiple publications, often called salami-slicing; text recycling; and copyright infringement. Reverse plagiarism, or attribution without copying, refers to falsely giving authorship credit over a work to a person who did not author it, or falsely claiming a source supports an assertion that the source does not make. While both the term and activity are relatively rare, incidents of reverse plagiarism do occur typically in similar contexts as traditional plagiarism. qtd. in Stepchyshyn, Vera; Nelson, Robert S. (2007). Library plagiarism policies. Assoc. of College & Resrch Libraries. p. 65. ISBN 978-0-8389-8416-1. ^ a b c Green, Stuart P. (2002). "Plagiarism, Norms, and the Limits of Theft Law: Some Observations on the Use of Criminal Sanctions in Enforcing Intellectual Property Rights". Hastings Law Journal. 54 (1). SSRN 315562. ^ Valpy, Francis Edward Jackson (2005). Etymological Dictionary of the Latin Language. p. 345. ISBN 9781402173844. entry for plagium, quotation: "the crime of kidnapping." ^ "Online Etymology Dictionary". Retrieved April 24, 2011. ^ a b Newton, Philip M.; Lang, Christopher (1 January 2016). "Custom Essay Writers, Freelancers, and Other Paid Third Parties". In Bretag, Tracey (ed.). Handbook of Academic Integrity. Springer Singapore. pp. 249–271. doi:10.1007/978-981-287-098-8_38. ISBN 978-981-287-097-1. ^ Gabriel, Trip (1 August 2010). "Plagiarism Lines Blur for Students in Digital Age". The New York Times. ^ Lipson, Abigail (2003). "The Responsible Plagiarist". About Campus. 8- issue 3 (3): 7–14. doi:10.1177/108648220300800304. ^ Grove, Jack (7 August 2014). "Sinister buttocks? Roget would blush at the crafty cheek Middlesex lecturer gets to the bottom of meaningless phrases found while marking essays". Times Higher Education. Retrieved 15 July 2015. ^ Kock, N (July 1999). "A case of academic plagiarism". Communications of the ACM. 42 (7): 96–104. CiteSeerX 10.1.1.170.1018. doi:10.1145/306549.306594. ^ Kock, N., Davison, R. (December 2003). "Dealing with plagiarism in the information systems research community: a look at factors that drive plagiarism and ways to address them". MIS Quarterly, 27 (4): 511–32. ^ Clarke, Roger (2006). "Plagiarism by academics: More complex than it seems". Journal of the Association for Information Systems. 7 (1): 91–121. doi:10.17705/1jais.00081. ISSN 1536-9323. ^ "plagiarism Archives – Retraction Watch". ^ "What is Plagiarism" Archived 2012-10-26 at the Wayback Machine. Stanford University. 2012-07-27. ^ "Student Honor Code". Emory: Oxford College. 2012-07-27. ^ USNA Statements on Plagiarism - Avoiding Plagiarism US Naval Academy, Retrieved April 5, 2017. ^ "The Plagiarism Spectrum". Turnitin. Retrieved 7 August 2018. ^ Newton, Philip (2 April 2016). "Academic integrity: a quantitative study of confidence and understanding in students at the start of their higher education" (PDF). Assessment & Evaluation in Higher Education. 41 (3): 482–497. doi:10.1080/02602938.2015.1024199. ^ Tennant, Peter; Rowell, Gill (2009–2010). "Benchmark Plagiarism Tariff" (PDF). plagiarism advice.org. iParadigms Europe. Retrieved 9 August 2013. ^ a b Sattler, Sebastian; Wiegel, Constantin; Veen, Floris van (2017). "The use frequency of 10 different methods for preventing and detecting academic dishonesty and the factors influencing their use". Studies in Higher Education. 42 (6): 1126–1144. doi:10.1080/03075079.2015.1085007. ^ Dawes, John (20 July 2018). "Practical Prevention of Plagiarism for University Faculty & Management – 14 Tactics". SSRN 3209034. ^ a b Ireland, Chris; Huddersfield, University of; UK; English, John; Huddersfield, University of; UK (1 October 2011). "Let Them Plagiarise: Developing Academic Writing in a Safe Environment". Journal of Academic Writing. 1 (1): 165–172. doi:10.18552/joaw.v1i1.10. ^ Gill Byrne; Chris Ireland (2011). "Using Technology to Prevent Plagiarism: Skilling the Students" (PDF) (Working Paper). ^ Serviss, Tricia (1 January 2015). "Creating Faculty Development Programming to Prevent Plagiarism: Three Approaches". In Bretag, Tracey Ann (ed.). Handbook of Academic Integrity. Springer Singapore. pp. 1–14. doi:10.1007/978-981-287-079-7_73-1. ISBN 9789812870797 – via link.springer.com. ^ Patrzek, J.; Sattler, S.; van Veen, F.; Grunschel, C.; Fries, S. (2014). "Investigating the Effect of Academic Procrastination on the Frequency and Variety of Academic Misconduct: A Panel Study". Studies in Higher Education. 40 (6): 1–16. doi:10.1080/03075079.2013.854765. ^ Sebastian Sattler, Peter Graeff, Sebastian Willen: Explaining the Decision to Plagiarize: An Empirical Test of the Interplay Between Rationality, Norms, and Opportunity. In: Deviant Behavior. 34, 2013, S. 444–463, doi:10.1080/01639625.2012.735909. ^ "Journalism". Famous Plagiarists.com / War On Plagiarism.org. Archived from the original on 26 February 2007. Retrieved 9 August 2013. ^ Dellavalle, Robert P.; Banks, Marcus A.; Ellis, Jeffrey I. (September 2007). "Frequently asked questions regarding self-plagiarism: How to avoid recycling fraud". Journal of the American Academy of Dermatology. 57 (3): 527. doi:10.1016/j.jaad.2007.05.018. PMC 2679117. PMID 17707155. ^ Rebecca Attwood. "Allow me to rephrase, and boost my tally of articles". Times Higher Education. 3 July 2008. ^ Hexham, Irving (2005). "The Plague of Plagiarism: Academic Plagiarism Defined". UCalgary.ca. ^ a b c d e Samuelson, Pamela (August 1994). "Self-plagiarism or fair use?" (PDF). Communications of the ACM. 37 (8): 21–5. doi:10.1145/179606.179731. ^ Roig, M. (2015). On reusing our previously disseminated work. American Association for the Advancement of Science. ^ Broome, M (November 2004). "Self-plagiarism: Oxymoron, fair use, or scientific misconduct?". Nursing Outlook. 52 (6): 273–4. doi:10.1016/j.outlook.2004.10.001. PMID 15614263. ^ Andreescu, Liviu (November 2012). "Self-Plagiarism in Academic Publishing: The Anatomy of a Misnomer". Science and Engineering Ethics. 19 (3): 775–797. doi:10.1007/s11948-012-9416-1. PMID 23179068. ^ Bird, SJ (October 2002). "Self-plagiarism and dual and redundant publications: what is the problem? Commentary on 'Seven ways to plagiarize: handling real allegations of research misconduct'". Science and Engineering Ethics. 8 (4): 543–4. doi:10.1007/s11948-002-0007-4. PMID 12501723. ^ Scanlon, PM (2007). "Song from myself: an anatomy of self-plagiarism". Plagiary. 2 (1): 1–11. hdl:2027/spo.5240451.0002.007. ^ Lorraine Eden. "JIBS Code of Ethics". Journal of International Business Studies. Archived from the original on 2010-07-23. Retrieved 2010-08-02. ^ "ACM Policy and Procedures on Plagiarism". June 2010. ^ a b "Statement on Standards of Professional Conduct". American Historical Association. 2005-01-06. Retrieved 2009-04-16. ^ a b Derrida  quotation: (p.40):[full citation needed] "The boundaries between permissible and impermissible, imitation, stylistic plagiarism, copy, replica and forgery remain nebulous." ^ Arnau  quotation: (p. 40) "The boundaries between permissible and impermissible, imitation, stylistic plagiarism, copy, replica and forgery remain nebulous." ^ Graham, Ruth (January 7, 2014). "Word Theft". Poetryfoundation.org. Retrieved 2014-01-09. ^ "Copyscape Searches For Scraped Content". WebProNews. Archived from the original on 2007-02-21. ^ Jones, Del (August 1, 2006). "Authorship gets lost on Web". USA Today. ^ Welch, Maura (May 8, 2006). "Online plagiarism strikes blog world". The Boston Globe. ^ ‘Plagiarism, Norms, and the Limits of Theft Law: Some Observations on the Use of Criminal Sanctions in Enforcing Intellectual Property Rights’ (2002-3) 54 Hastings Law Journal 167, 180. ^ "Academic dishonesty and misconduct: Curbing plagiarism in the Muslim world by Abdul Rashid Moten" (PDF). Retrieved 31 January 2019. ^ "The Intersection of Copyright Plagiarism and the Monitoring of Student Work by Educational Institutions by Mary Wyburn and John Macphail" (PDF). anzela.edu.au. Retrieved 31 January 2019. ^ "Reverse Plagiarism? Or, Did I Say That?". 2007-11-26. Hutcheon, Linda (1985). "3. The Pragmatic Range of Parody". A Theory of Parody: The Teachings of Twentieth-Century Art Forms. New York: Methuen. ISBN 978-0-252-06938-3. Lipson, Charles (2008). Doing Honest Work in College: How to Prepare Citations, Avoid Plagiarism, and Achieve Real Academic Success (2nd ed.). Chicago, IL: University of Chicago Press. ISBN 9780226484778. Retrieved April 5, 2017. Jude Carroll and Carl-Mikael Zetterling (2009). Guiding students away from plagiarism (in Swedish and English) (1st ed.). Stockholm, Sweden: KTH Royal Institute of Technology. pp. 86–167. ISBN 978-91-7415-403-0. Retrieved June 10, 2017.